Chariot racing revival in Rome? Historical society Vadis Al Maximo wants to bring chariot racing back to the Circus Maximus. It’s not as insane as it sounds, actually. Quadriga races have been held in Jordan and France over the past couple of years, with more to come this year in Germany and Bulgaria. The thing is, the way these guys are going about it seems overly ambitious, to put it mildly. I really don’t see them pulling this off in a year. I don’t see the city of Rome pulling something like this off, and it doesn’t have to beg, borrow and steal the necessary permits like a private organization does. ”All the main squares of the capital would be transformed into scenes from Ancient Rome, using props on loan from the Cinecitta film studios,” said Calo. But the effort involved in staging such an event would be enormous. ”According to our calculations, the Circus Maximus area could hold up to 35,000 people,” he said. ”Various maxi-screens would therefore need to be installed at various points outside the course so that people could watch the races”. 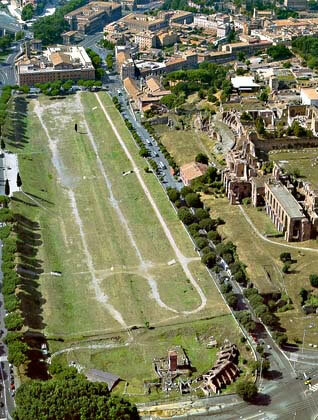 Restoring Rome’s Circus Maximus would include setting up platforms, security exits, a sidewalk, a stage at the centre of the course, a ditch and outdoor stables. It would also require the assistance of other organizations, including the sports department of Cinecitta for costumes and scenery, municipal authorities for public parking and security, and riding groups for the horses and race training. Yeeeah, see, that’s a little on the grandiose side. I vote they ditch the crazy movie stuff and just stick with making the Circus Maximus usable for its original hippodromic purposes. The city is considering the proposal, though, so who knows? It might just it happen.